Kostas Kalevras posted his update for Bank of Spain's (BdE) balance sheet this morning. Once again, both lending to banks and TARGET2 liability rose sharply. 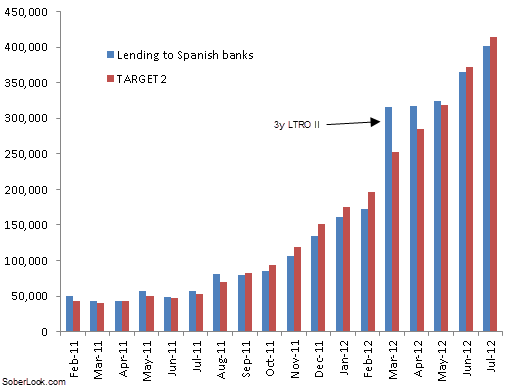 It is clear that lending to Spanish banks is now funded entirely via TARGET2 (borrowing from the rest of the Eurosystem) rather than with deposits. 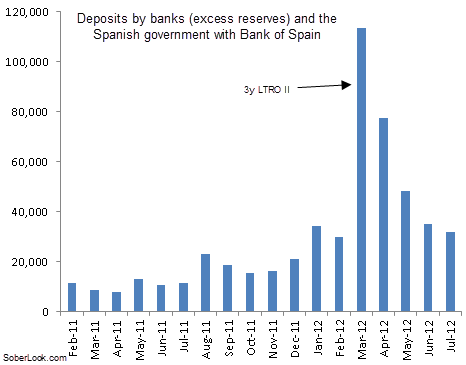 In fact deposits at the Bank of Spain by the Spanish government and Spanish banks (excess reserves) have been declining since the second 3y LTRO. These sources of funding have since been replaced by TARGET2, as the Eurosystem outside of Bank of Spain is now fully supporting the Spanish banking system .